Get the most out of every day, with an active lifestyle and balanced, healthy nutrition. 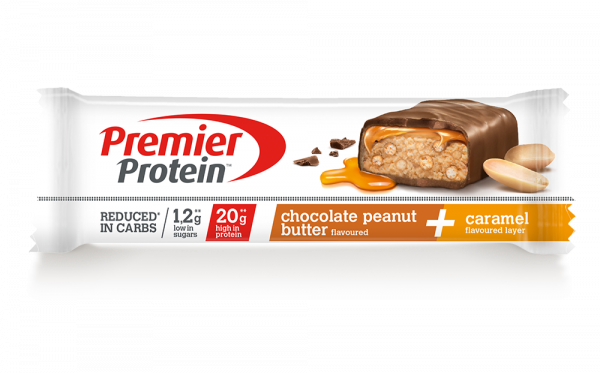 New Premier Protein TWO LAYER PROTEIN BAR: The tasty protein-snack with an extra delicious layer for great caramel taste. With 20g of protein* and only 1,2 g sugar*. Provides an extra delicious layer for great caramel taste. Milk chocolate couverture with sweetener (22%) [sweetener (maltitols), cocoa butter, whole milk powder, cocoa mass, emulsifier (soy lecithin), flavouring], hydrolysed collagen, milk proteins (calcium caseinate, whey protein isolate), humectant (glycerol), water, sweeteners (sorbitols, sucralose), soy crisps (soy protein, starch, salt), vegetable fats (palm kernel, palm), soy protein, dextrin (wheat), peanut flour (2%), peanut pulp (1%), rapeseed oil, flavourings, skimmed milk powder, emulsifiers (soy lecithin, mono- and diglycerides of fatty acids, sorbitan tristearate), acidity regulator (sodium citrates), salt. May contain: hazelnuts, almonds.